Dentures are natural-looking replacement teeth that are removable. 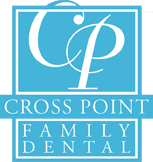 The team at Crosspoint Family Dental provides dentures to the Westford, MA community and surrounding towns. Our practice provides personalized denture services that meet the needs and comfort levels of all of our patients. We treat each patient with a unique approach to ensure dentures that look natural and feel comfortable. Crosspoint Family Dental provides two types of dentures. These include partial and full or, complete dentures. Complete Dentures – Given to patients when all of their natural teeth have been removed. Conventional full dentures are custom created to resemble natural teeth and are placed after the gum tissue has healed, this can take several months. Immediate full dentures are placed immediately after the teeth have been removed and may require future adjustments. Partial Dentures – Used when one or more natural teeth still remain. They are attached to a metal frame that is connected to natural teeth and used to fill in where permanent teeth have been removed. Partial dentures are considered a removable alternative to bridges. Dentures, like natural teeth, require daily maintenance to stay clean and prevent bacteria growth. It is best to stand over a clean, folded towel or sink full of water in case you accidently drop them. You should brush your dentures (preferably with a denture brush) daily to remove food deposits and plaque. This will also prevent permanent stains. If you are not wearing your dentures, it is important that they are kept moist. Remember to keep your gums, teeth and tongue clean every day. Contact Crosspoint Family Dental to learn more about dentures or to schedule a consultation in the Westford, MA area.